The Cross House is a monumental project. And in my fourteen months of ownership a great deal has been done. Steel beams have been inserted, windows have been restored, a new structural wall prevented collapse, original paint colors were determined and reapplied to the exterior, the boilers have been repaired, and all the radiators now work (for the first time in many decades). And the list goes on and on. While all this thrills me, for some unexplained reason it is sometimes the very small projects which cause particular delight. On the second floor is a door, which originally opened onto the blanket closet. 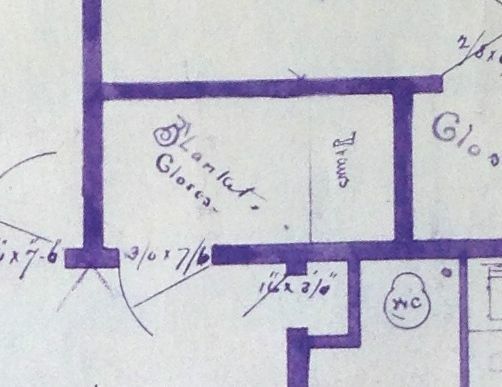 The closet was later combined with the adjacent housekeeper’s room in, I assume, the 1929 apartment conversion of the second floor. 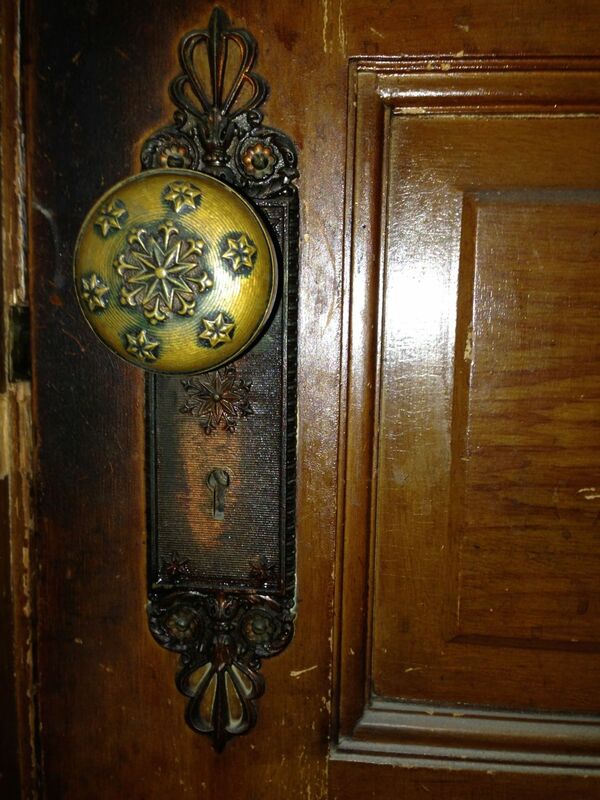 The side of the door facing the main hall has a lovely (really lovely) doorknob and back-plate. The door retains its original faux wood finish, which will look a lot better after I remove layers of later shellac. 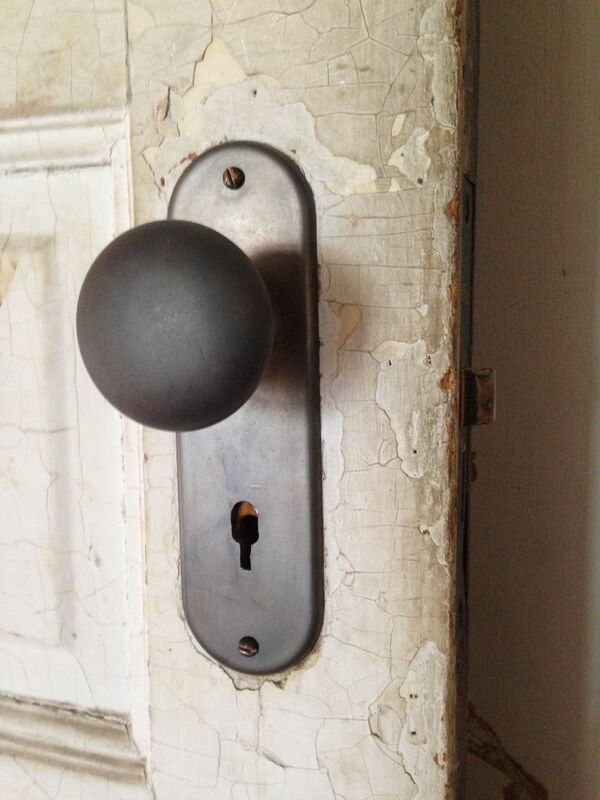 The side of the door which originally faced into the blanket closet was painted (a pale tan), and obviously did not have a fancy doorknob and back-plate. No, the hardware was as simple as could be, and matches the hardware in the kitchen. The combined blanket closet and housekeeper’s room is going to be my master bath. Eventually. In the meantime the room is entirely empty save one of the two working toilets in the huge house. The other day I — not for the first time — noticed the white paint glopped all over the simple inner hardware. And I really loath hardware with paint glopped all over it. L O A T H.
So, even though I had a lot of other things to do (an old house constant) I suddenly stopped what I was doing, and removed the offending hardware. I then stripped the paint, and put the hardware back on. An easy fix, yes, but my smile was very wide. And there was a petite flowering of joy in my heart. For, the Cross House was slightly better. The lost blanket closet, with drawers. The inner hardware. Yesterday it looked just as bad as the surrounding surface. A surface which one day will also be lovely. Now, I need to see if I can get a skeleton key made for the door. Won’t that be cool! Oh, the title of this post is from one of my favorite movies, Contact. In the movie, when the main character, Ellie Arroway, is just a girl, she is impatient to Get Things Done. Her father often, and with great gentleness, reminds her about the value of small moves. 9 Responses to Small moves, Ellie, small moves. I can really relate to being impatient trying to getting things done. I hadn’t given much thought, especially lately, to the “value of small moves”. Something to definitely to keep in mind. Thanks for sharing! I LOVE that movie! I haven’t read anything yet but the first line and I already know you are quoting one of my all-time favorite movies. Great principle application! Dare I say all you need now are the skeleton keys to go with it? You can get skeleton key blanks online and file them. I believe I saw a tutorial in this old house. It should be on their website. I’m glad I’m not the only one who gets sidetracked with small, but enjoyable tasks in the midst of other massive projects. It’s one of the pleasures of restoring homes as a hobby, rather than an occupation. Have you read “The Slow Regard of Silent Things” by Patrick Rothfuss? Your joy in the small things and your need to right what has been made wrong reminds me very much of the central character of that book. I love what you’re doing for the Cross House. I found your blog through Old House Dreams and reading through the old entries has been my obsession the past few weeks. Very nice to meet you! And thank you for the kind words! I added a hyperlink to your book suggestion! I will check it out!